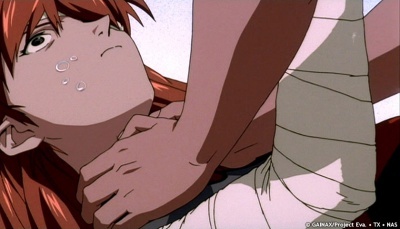 Is there a manga with a scene where Shinji chokes Asuka? I'm trying to find the manga where Shinji chokes Asuka. Does it exist? If yes then please help me find it. No, I don't believe there is. The entirety of Instrumentality happens in the last volume of the Sadamoto manga (volume 14) and there was no kitchen scene during instrumetality (where coffee is spilled and Shinji strangles Asuka while standing up) and when instrumentality ended, we were taken to a new stage of the world completely back to normal so there wasn't a beach scene either. However, there was a scene that wasn't in the anime where Shinji visits Asuka in the hospital and she gets out of bed and chokes him. Is the Evangelion Remake a remake or a sequel? Why does Asuka caress Shinji in EoE? Why did Asuka get her right eye injured but Shinji didn't? What is the reading order for Kawaraya A-ta's Asuka and Rei (and sometimes Mari) H-Doujinshi?